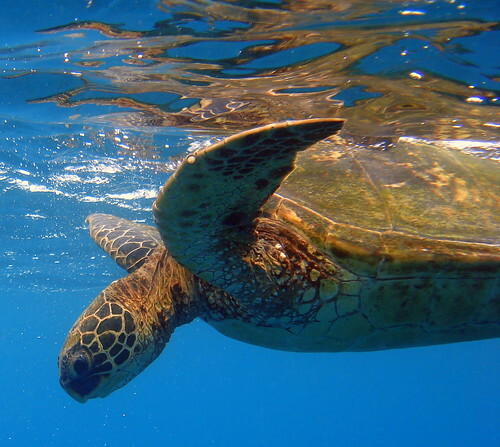 The Green Sea Turtle ("Honu" in Hawaiian) is the most commonly found turtle in the Hawaiian Islands. Although this species is more abundant than the nearly-extinct Hawksbill and easier to locate than the deep-sea dwelling Leatherback, it is still an endangered species. It is against the law to touch, ride or otherwise harass a Green Sea Turtle. While snorkeling off the southern coast of Maui, I was fortunate enough to find myself in the exact location of a Turtle rising to the surface and who came so close that I had to exert myself to keep from touching the animal. I did, however, manage to snap a few photos while he lingered nearby.